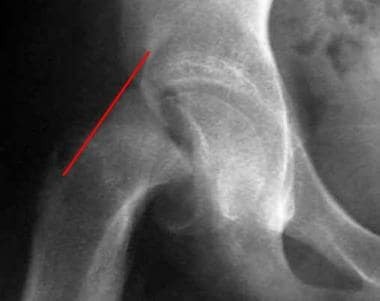 Slipped capital femoral epiphysis (SCFE) is one of the most important pediatric and adolescent hip disorders encountered in medical practice. [1, 2, 3, 4, 5, 6] Although SCFE is a rare condition, an accurate diagnosis combined with immediate treatment is critical. [7, 8] Despite the fact that the underlying defect may be multifactorial (eg, mechanical and constitutional factors), SCFE represents a unique type of instability of the proximal femoral growth plate. Clinically, the patient may report hip pain, medial thigh pain, and/or knee pain; an acute or insidious onset of a limp; and decreased range of motion of the hip. The overall incidence for SCFE in the United States is 10.8 cases per 100,000 children. The incidence rate in boys (13.35 per 100,000) is higher than in girls (8.07 per 100,000). When compared with white children, black children have a higher incidence rate at 3.94 times, and Hispanic children have a 2.54 times higher incidence rate. The risk of SCFE is increased in children who are obese, as well as in children with other medical issues such as hypothyroidism, low growth hormone level, pituitary tumors, craniopharyngioma, Down syndrome, renal osteodystrophy, and adiposogenital syndrome. 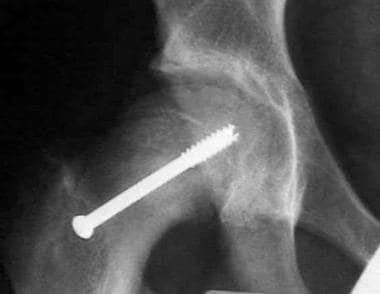 SCFE results from a Salter-Harris type physeal fracture. In patients with SCFE, the epiphyseal growth plate is unusually widened, primarily due to expansion of the zone of hypertrophy. The hypertrophic zone, which constitutes 15-30% of the normal physis, can account for up to 80% of the width of the physeal plate in affected patients. Histologically, abnormal cartilage maturation, endochondral ossification, and perichondral ring instability occur. This leads to less organization of the normal cartilaginous columnar architecture. Slippage occurs through this weakened area. The position of the proximal physis normally changes from horizontal to oblique during preadolescence and adolescence, redirecting hip forces from compression forces to shear forces. There is an association between femoral neck retroversion and a reduced neck-shaft angle with SCFE. These changes can increase the shear forces across the hip, leading to SCFE. Other concomitant findings in the hip include inflammatory synovitis and disorganized collagen fibrils with accumulations of proteoglycans and glycoproteins within the growth plate; however, whether these changes are a cause or a result of SCFE remains undetermined.